What is the Animal News Van? 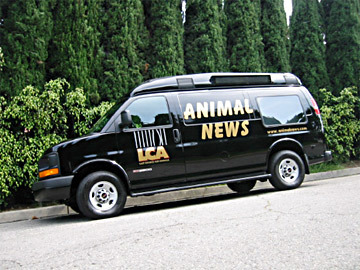 The Animal News Van (ANV) is Last Chance for Animal’s education and news reporting tool. Partnered with the LCAnimal.org website, it effectively educates millions of people in Southern California on animal issues. The van’s TV screens, speaker system, and LED message board impart important information. It is the first of its kind on the West Coast, reaching people across cultural and economic lines. What Does the ANV Educate About? The ANV educates the public about the plight of animals used in modern society for food, entertainment, clothing and scientific curiosity. I reached out to local volunteers and offered to participate when there was an outreach event that needed some help. A couple weeks ago, there was an opportunity at the Escondido Street Fair, and I signed up for the morning shift. It was a great opportunity to connect with the public and educate them about the plight of factory farmed animals and the myriad of vegan options that are cruelty-free and SO healthy. We handed out lots of vegan chocolate chip cookies and plant-based “milk”. If you’ve never heard of Last Chance for Animals, visit the website and get involved! Who’s the most intelligent, caring, and forward thinking of them all? Lolz, THIS is pic speaks a thousand words, doesn’t it? At the last of three Mayoral candidate debates/forums in Carlsbad, this one hosted by Pacific Ridge School and moderated by Voice of San Diego’s Jesse Marx, we witnessed a tired old sour faced dinosaur listening to the brilliant words spoken by a true visionary. THIS is what Carlsbad needs. Mayor Mall is the embodiment of “liar liar pants of fire“. He was not truthful when he said he really really really responds to each and every email. I can only speak for myself BUT I know that is specifically and categorically UNtrue. He has NEVER responded nor acknowledged any email OR snail mail letter I personally sent to him during the years he’s been mayor of Carlsbad. He delivered more confusing and obfuscating word salad, but what REALLY spoke to me was the demeaning and misogynistic device he used by consistently referring to Cori Schumacher as “her” or “she”, instead of affording her the respect Cori deserves by speaking her name, and by snarkily laughing while she was responding to questions. This is a tool in the arsenal of a misogynist who covertly/overtly minimizes, diminishes, and depersonalizes women. We will no longer have our voices silenced. It’s a win-win for Carlsbad. Despite suffering from a sinus infection, Sea Shepherd’s Captain Paul Watson showed up on Saturday morning to meet and chat with the public when the vessel, M/V Farley Mowat, was docked in San Diego Harbor at the Maritime Museum, offering free tours all weekend. I took the train downtown and got there just in time to greet Capt. Watson as he arrived, and he kindly set aside time to respond to a couple of questions. This is a man who walks the walk and talks the talk. He is a man of integrity and I admire him immensely and support his ideals and goals. While I’m waiting for the pics and video to download to WordPress, I’ll ask you a question…do you know who Farley Mowat was? Canadian born, he authored one of the books that inspired me and shaped my existence as a wolf activist: Never Cry Wolf. He created a body of work staggering in its quality and breadth: Sea of Slaughter, A Whale for the Killing, Grey Seas Under, Lost in the Barrens, Virunga: The Life of Dian Fossey (that became the movie Gorillas in the Mist), and many more. One of Canada’s most popular and prolific writers, he became a champion of wildlife and native Canadian rights and a sharp critic of environmental abuse. His writing spoke deep truths about humanity’s responsibility for the planet and the species we share it with. In doing so, he became one of the pioneers of the environmental movement. The Sea Shepherd Conservation Society ship Farley Mowat was named in his honor, and he frequently visited it to assist its mission. Nothing happens without dedicated volunteers! Captain Paul Watson is a Canadian-American marine wildlife conservation and environmental activist who founded the Sea Shepherd Conservation Society, an anti-poaching and direct action group focused on marine conservation and marine conservation activism. Since WordPress doesn’t allow me to post videos directly to a post (I have a free blog), here’s a link to a couple of videos of Capt. Watson I posted on Facebook. It can’t be embedded, but if you click on “Watch on Facebook”, you’ll be able to watch! And they are DELICIOUS, much to even my surprise, haha. I was playing around in the kitchen this morning and thought I’d challenge myself to experiment baking with only the ingredients I have in my pantry. I thought these cookies were going to be making the short journey from oven to compost BUT they surprised me, so I thought I should share the recipe before I forget. If you try them, let me know what you think. Place one cup cooked lentils in bowl. Combine the kale and the oil in a blender/Bullet/food processor. Blend until a smooth slurry. Add agave/maple syrup, vanilla, raisins, chia, and all other ingredients. Mix until flours are well incorporated. Let chill in refrigerator a few minutes until the oven is heated to 375 degrees. Using a teaspoon, place about two inches apart on baking sheet. Flatten with a fork coated in flour so it won’t stick. Bake for about 17 minutes until bottom is golden brown and the top is firm. ***Options: Of course if your pantry is more well stocked than mine, you can def add grated apples, coconut, and other dried fruit and nuts. I forgot the TV was on, scrolling through my Facebook feed, when I heard an advertisement about Jungle Jack Hanna coming to the San Diego area. In a sparkle of synchronicity, when I looked up, there was an episode of Jack Hanna’s Wild Countdown. You know who he is, right? He’s been around forever on all the late night talk shows. Often with his wife by his side, attired in his khaki uniform, he’s a virtual fountain of animal knowledge. John Bushnell “Jack” Hanna is an American zookeeper, Director Emeritus of the Columbus Zoo and Aquarium. He was director of the zoo from 1978 to 1992, and is viewed as largely responsible for elevating its quality and reputation. He’s the host of TV’sEmmy award winning Jack Hanna’s Into the Wild and Jack Hanna’s Wild Countdown. We have a bit of a difference of opinion about Seaworld and zoos in general, and while he concedes that certain things about Blackfish were a real portrayal of what happened with the whales, he’s a staunch and passionate supporter of their rescue skills and education programs. He is involved as a person who supported Seaworld since the beginning. Very big proponent of Seaworld’s conservation efforts. Manatees were going extinct –and Seaworld saved them. Disappointed with people who hate Seaworld. He doesn’t agree with anything that might harm the animal. He made a point I have to agree with. There are no real completely wild places left in this world. When he’s filming, his guidelines are to respect the animals, don’t teach them to do anything unnatural. Back off, or don’t interfere or interrupt the kill. I know that he works with the critically endangered mountain gorillas in Rwanda and they hold a special place in his heart. I was recently at the zoo in Seattle and took my grandson to see the gorillas (a favorite animal), and it was heartbreaking to see them. They looked completely depressed to me, and desperately need their habitat improved. There were blankets strewn about on the dirt ground and it looked as sad as a homeless encampment. I had plans to ask him more questions, but there wasn’t time as he had to prepare for his flight to San Diego. What do you think about the current admin’s decision to reduce the size of our national parks? The show started at 6pm and I made sure I was there in plenty of time to get a little backstage time, if possible. I was pleasantly surprised that it was a packed house with so many people interested in learning about animals. Unfortunately, something went wrong with my Canon Rebel T3i , so all I have are the pics I took with my iPhone. It was pretty funny when the kangaroo got to run around the room but it happened so fast, I didn’t get any video. While we don’t completely agree on several issues, I have mad respect for Jungle Jack Hanna’s passion for wildlife conservation, as well as his very obvious love for his wife of 47 years, his children and grandchildren.